Well, I see your confusion – how to choose the best drone model among those thousands models of already existing ones? How much it is ok to pay for it – 20, 100, 1000 or 5000 dollars? So, if you’ve decided to buy a quadcopter but the problem is which one to choose – here you’ll get the answers to all your questions. There are 18 drone models in our review ranging from the simplest to the most advanced ones plus a detailed guide. 1 Well, it is how to choose the best drone? 1.1 What is a multirotor? What is the difference between quadcopter and hexacopter? 1.2 First, make up your mind – why do you need a drone at all? 6 What is the difference between drones? 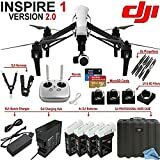 6.1 A drone with camera or without it? 6.3 A drone control – via flight controller or a smartphone? 6.4 Speed, flying range and time? 6.9 How much money are you ready to spend? 6.10 How not to break or loose your drone? Well, it is how to choose the best drone? What is a multirotor? What is the difference between quadcopter and hexacopter? First we should clarify the terms that are used. We are going to call the flying machines – drones, though it’s not very correct. The thing is that drone is a spoken term which is just easier to be said. The right name for these devices is a multirotor or a multicopter. Depending on the number of rotors a drone is called tricopter (3 rotors), quadcopter (4 rotors), hexacopter (6 rotors) or octocopter (8 rotors). Quadcopter — its the most popular one among multicopters. Its 4 rotors ensure rather sufficient stability, overflight height, control response and flying range. The device has diagonal rotors that move in one direction along one device diagonal and in the opposite direction along the other diagonal. As for hexacopters and octocopters – they can lift high and carry some heavy equipment. If one of the rotors breaks down the device still can land successfully unlike quadcopters and tricopters which just fall down in this case. These multicopter models are the most reliable one and the most expensive as well. Tricopter – is rather rare sort of multicopters. Its advantages are small size and light weight as well as high control response. For these reasons (rather narrow application range) we won’t include them in our review. First, make up your mind – why do you need a drone at all? It’s better to make this choice seriously and consciously. Ask yourself a question: why do I need this device? Just for fun? To present it to someone? To train before flying professional drones? For some amateur or professional video recording? To make money by uploading your unique videos to youtube? For some professional business applications? If you need the machine as an entertainment – it’s not worth spending a lot of money. Your requirements can be met by buying the simplest quadcopter models. You’ll just have to choose the proper size of the device (since quadcopters differ in diameter – from several inches to dozens of inches) and decide how much money you’d like to spend. However, if you need a quadcopter to film video than you should consider the devices which can carry a GoPro or those that already have a camera installed. The price of quadcopters capable to carry GoPro and designed specially for video recording starts from $500 (these are mainly old models without GPS), but it’s better to be ready to spend about $1000-1500. In this case you’ll surely find what you are looking for. So you have your own business? And require fast, reliable and modern delivery of your clients’ orders? Here are the good news! Load-lifting drones already exist! Though high quality models are still hard to find on the market. Thus when choosing the device for goods delivery pay attention to its rotor blades number, flight endurance and carrying capacity. If you want to minimize the risks – GPS unit on board will make the device flight more reliable and controllable as well as helps to find the device if it gets lost. Below you may find the list of abbreviations and some special terms widely used both by drones manufacturers and users. Ready-to-fly (RTF) – this abbreviation usually comes on the device packaging right after the model name and it means that the drone is already assembled and ready for use. The only thing you should do yourself is to faster the rotors and check the battery level. Almost-ready-to-fly (ARTF or ARF) – this means that some basic components are missing in the device set – such as a special unit, a battery or a transmitter. Without them the machine won’t work. It’s important to take this into account when choosing a drone. Bind-N-Fly (BNF) – this abbreviation says that the device set has no transmitter (a thing to control the machine) in it and without it the drone won’t fly. You’ll have to buy it yourself. At that you should remember that a remote control device and a drone use the same frequency range. Return-to-home (RTH) – means that the device has a function of automatic return to a flight operator in case of a crash or if the battery gets critically low. Gimbal – says that this drone has a 3-axis precision gimbal camera – a motorized arm that uses accelerometers and gyroscopes to stabilize the camera. Headless mode – if you see this word combination on a drone packaging it means that the device has a simplified control mode. You can control it same way regardless of its location relative to a user. That is no matter which side the drone faces its user – front or back one: in both cases the device will fly in the user’s direction. Follow me – is the name of the mode using which you make the drone follow its user (namely, follow the device that controls the drone). Brushless motor – this says that Brushless motor comes in the device set. This motor unlike brush-type ones is more powerful, durable and less noisy. Quadcopter market grows constantly. Each year 2-3 new companies enter it and present their radio-controlled drone models. On one hand it ensures wide range of choice for buyers and on the other hand it makes us go deeper into drone details while trying to choose the best one. To make this process easier we’ve decided to make a list of the most currently popular quadcopters (for winter-spring of 2018): it includes both small toy quadcopters, average sized ones and professional drones with camera. A new Parrot Bebop Drone 2 is designed first of all for newbies in the field of radio-controlled flying machines. The manufacturer has equipped this copter with more powerful battery (2700 mAh capacity), due to which parrot drone flying time has increased from 11 to 25 minutes. Parrot Bepop 2 has easy and user-friendly control interface both from a smartphone or a tablet. The drone comes with a remote control device Parrot Skycontroller, that improves flying possibilities of the machine. The main feature of Bebop Drone 2 is its unique camera (located on a stabilizing arms) with a sensor for 14 Mpx and a Fisheye objective. The camera can film quality Full HD video and take pictures with maximal resolution. Due to strong software and hardware platform the manufacturer succeeded in implementation of digital video stabilization system that performs as good as gyro stabilization. Another feature of this drone is its position control system GNSS (GPS + GLONASS + Galileo). An embedded unit allows tracking the device location, setting in advance the route for it to fly by an autopilot as well as getting it back to the flying-off point with one touch. Parrot Bebop has been the company’s flagship model for a long time, but now the model number 2 was produced. This model has an obvious advantage over the previous one due to its This model has an obvious advantage over the previous one due to its improved flying characteristics, twice longer off-line work duration, a new camera and smaller size. Unlike its predecessor Parrot Bebop 2 advantages can be easily seen – it is more powerful due to higher tightness of its brushless motor winding as well as to new and more efficient speed controllers. The camera has been upgraded and now it films better if there’s lack of light and thanks to a new optical system and higher inclination angle of the camera itself much more objects will get into its frame. The designers have equipped the machine with a powerful battery which more than twice increased the flying time in comparison with the previous model. There are powerful LED tap lights on the device’s back side. A new GPS controller Ublox Neo 8M is mounted on the device, which has raised the number of the satellites being detected up to 19 (as against 12 that the previous model has). Therefore now the drone positional precision has been sufficiently improved. On Parrot Bebop 2 board there is 14 Mpx camera with digital 3-axis stabilization set to an angle into a polypropylene box in the device head. Completely new fisheye lens has improved the camera filming ability when there is lack of light. It records video with 1920 × 1080Р resolution at 30 fps, in H264 format as well as takes photos with 4096 × 3072 resolution in JPEG / RAW / DNG formats. The quality of video is perfect as for a drone of such class, although we can’t say the same about the pictures it takes. Digital stabilization does its work perfectly, as well as the camera angle is wonderful – it films almost under itself though it has no carrier arm. Parrot Bebop 2 battery is 3S 11.1В 2700mAh LiPo, unlike it was stated by the manufacturer instead of 15 minutes of flight endurance the device has demonstrated 25 minutes at medium wind with some gusts and with working camera (the battery charge was 100% at the beginning of the test and 5% at the end with a warning and automatic return of the device). Parrot Bebop 2 control can be performed with a single device (IOS/Android) as well as together with a hi-tech remote control Parrot Black Skycontroller. The latter is expensive but more convenient and functional. When the device is controlled with one gadget its flying range is up to 10 feet and once you join it with Parrot Black Skycontroller the flying range increases up to 1.24 miles. The remote control supports connection to FPV glasses tandem via HDMI port that is on the remote control. When using these devices together (the drone / a gadget /the remote control device /FPV glasses) the pilot gets the most full and unspeakable flying experiences. Currently Parrot Black Skycontroller remote control is compatible with FPV-glasses made by «Sony FPV» and «Zeiss Cinemizer», but the manufacturer says that this list will be longer in future. It is a perfect drone for action-flights which gives a delightful experience when flying using the remote control device and FPV-glasses. Parrot Bebop 2 is very fast-moving which makes it so longed-for. It’s user friendly interface allows using the device from the very first time without training on simpler models to get the idea of how to fly a drone. We should mention that Bebop 2 is designed more for FPV flights, therefore you shouldn’t buy it if you are looking for a drone to perform high quality landscape recording. A perfect drone for landscape quality filming. This device will do for experienced pilots or professional photographs. 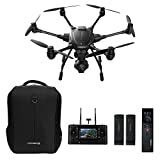 The drone set consists of the bestselling quadcopter Yuneec Typhoon Q500+ with 4К camera, that has lots of settings and it will satisfy even a professional camera operator. Then goes a remote control with an embedded 5.5-inch touchscreen, Steady Grip (a handler for stabilization when filming on the ground) and two powerful batteries 6300 mA·h, each of which provides quadcopter Yuneec Typhoon Q500+ with 25 minutes of flying time. The complete set is put into a professional aluminum case that improves it transportability and allows getting the device ready to fly in several minutes. CGO+ feature in Yuneec Typhoon Q500 quadcopter is that the camera is portable. Besides, you can put the camera on a light stand Steady Grip and record video without using the copter. Steady Grip has attachments for a smartphone, so you can broadcast video from the camera there – use mobile app CGO to do this. Yuneec Typhoon Q500 with 4K camera is regarded as a serious competitor to the latest models of DJI Phantom quadcopters. We should mention that Yuneec Q500 Typhoon 4K is supplied in a complete package, which means that no further adjustments are required. A scope of supply may vary from a “basic” set, that includes only the drone itself, a battery, a power supply, a remote control device and an external mounting for the camera, to the “complete” set. Yuneec Typhoon and the camera are sold in a one set with an aluminum case for them, where all necessary spare parts and expendables required for filming outside easily fit. 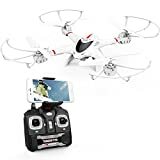 Q500 Typhoon is an ideal quadcopter for those, who want to buy a radio-controlled drone with a camera, charge a battery and start to fly and film video for Youtube at the same time. The thing is that all accessories needed to make the drone fly already come in its set. According to its manual - having one fully charged 5400 mAh battery the drone can fly for 25 minutes maximum, under real-life conditions it is a bit less - about 21-22 minutes. It depends on how the drone is controlled, manipulation activity and weather. The battery charges completely in 2 hours. There is an adapter for power supply plug it in a car's lighter socket, so you can be sure that filming outside can be easily performed. Another thing is that it's quite troublesome to take such an “expensive toy” with you when you go hiking for example – the quadcopter frame is — 16.5х16.5 cm and the device is 7.8 cm high. You can't use it inside for sure, however outside a drone of such size is easier to be seen and controlled, besides it is much quieter than its smaller sized fellows (due to its rotors smaller diameter and lower engine rotational rate). The drone flying range is about 2600 feet, height — 400 (by default), but you can adjust maximum height level yourself. Q500 Typhoon is equipped with a compass and GPS unit as well as with a function of automatic return home (to the initial flying-off point). You can control the drone using 3 different modes (Smart, Angle and Home). The most advanced modes require GPS connection: they limit the flying speed, but make the control process much simpler. The most easy and rough control mode is a direct control – it requires only the compass calibration and after that the quadcopter can fly at overwhelming speed (up to 50-55 m/h), it completely responds the user, although in this case automatic position control, wind resistance and other cool stuff that semiautomatic modes can offer are out of question. But the most amazing feature of this new copter is its ability to follow the user with a GPS PLB (personal locator beacon or a smartphone) at some distance and film this. Of course, there is a function to broadcast video from the camera directly to the remote control device screen. Perfect filming quality, package contents which are more than enough, the remote control of “all inclusive” type, which doesn't require buying any tablet additionally or using a smartphone as a screen – are rather significant Typhoon 4k advantages. 3DR Solo is the first copter that provides direct control for Go Pro camera. The device allows streamed HD-video broadcasting right to your mobile device by means of a controller. 3DR company has been working side by side with GoPro, due to which Solo has full access to all camera settings. Now you can start and stop filming when you fly, you can choose images that you want to delete or save just during the flight – this reduces the number of needless shots. In this case - don't hesitate and buy this device. But if a word collocation “open source” means nothing to you, you don't have a GoPro and a “gyropilot” drone function doesn't make your heart beat faster – 3DR Solo Smart Drone can turn out to be just a very expensive toy for you. Smart Drone resembles its predecessors IRIS+ and X8 in its appearance. The copter designers decided to create totally unique design and we can say for sure that they have reached their goal – the new drone looks like any other device. One of the quadcopter design features is a room for its accessories made right in the drone. Therefore you can keep spare parts right inside the device saving the space in your bag or case. The camera is not foreseen by the package contents and it can be bought alone. Let me emphasize one more time, that Solo Drone is designed perfectly for GoPro HERO3 and GoPro HERO4. These cameras are the ones that'll provide the best experiences when flying the copter, since both stabilization technology, remote control device and software were made exactly for these cameras. The copter has the newest gyropilot Pixhawk 2. This allows giving the device a necessary flying route in advance and take the required photos and record video during the flight. As for the other gyropilot functions we should mention its ability to fly around some object in 360 degrees path. 3DR Solo remote control has fixturing for mobile devices that work on iOS and Android. It also has a HDMI-port, so you will be able to observe the drone flight in the real time scale on any monitor or TV. The quadcopter set includes 5200mAh battery. If using a standard power supply it charges in 90-100 minutes, though this is enough for just 20 minutes of the drone flight with a motorized stabilizing arm and a camera installed (you may extend this time to 25 minutes without them). Nowadays 3DR Solo Drone is one of the best designed quadcopters. It has strong carriers, its rotors are made from reinforced fiber-optic nylon – even in case of heavy landing the device is safe. The drone supports are arranged so that they protect the motorized arm ( and your GoPro camera), since they face the hit when the drone crashes. This device with 6 rotors costs less than Phantom 4, at that it has all the functions of its main rival and even a few additional functions. Is this enough to compete with such bestsellers as P4 and 3DR Solo? Lets find out. Hexacopter Yuneec Typhoon H is a ready-to-fly device (RTF) and belongs to «Smart Drons» market segment and it means that its user doesn't have to have any experience in flying drones before. Yuneec Typhoon H hexacopter is made for taking highly intelligent and high quality professional photos and video recording. Typhoon H is a hexacopter, i.e. it has 6 rotors instead of standard 4 ones at that it needs just 5 rotors to fly. In case if one of its rotors gets broken, the rest will be enough to continue flying. Typhoon H has become the 1st one in the product line of Yuneec Typhoon, that has 360 degrees rotating motorized arm for the camera. It sufficiently broadens the hexacopter functions. Its closest rival with a similar stabilizing technology is DJI Inspire, that costs twice as much. Besides Yuneec Typhoon H has an embedded dodging system. While Phantom 4 relies on optical sensors, Yuneec hexacopter uses sonars that allows preventing crashes even in complete darkness. Though we have to mention that the sensors are placed on the drone front side and they can detect only the obstacles in front of them. Another advantage of the device is a full set of off-line modes. All the modes that 3DR Solo and Phantom 4 have, Typhoon H has as well — Cable Cam, Orbit, Follow me and others. They let the user delegate them the device control and concentrate only on camera manipulating. The drone control is performed by means of its own ground station ST16 that uses OS Android. Apart from analogue control the station allows its user to program an off-line mode flight, take cool pictures and record video. The station also has 7 inch HD touchscreen that displays basic telemetry probing during the flight as well as photo and video data in the real time scale. These are being broadcasted from the drone 4K camera installed on 3-axis gimbal. 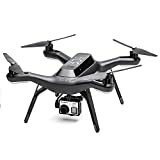 Yuneec Typhoon H camera marked as CG03+ - is an upgraded version of CG03 camera that Typhoon Q500 4K drone has. It can film 4K video at 30 fps or 1080p at 60 fps. Unlike its predecessor CG03+ camera has larger matrix, faster processor and wider camera angle (115 degrees). This camera also can take pictures with 12 megapixel resolution and its objective is protected from optical distortions. Considering all these features of this new camera, GoPro camera can not be in the same league with it. In compatison with its main rivals — DJI Phantom 4 and 3DR Solo — Yuneec Typhoon H copter wins on almost all parameters. Of course, the machine isn't an ideal one, but its performance capabilities are just amazing. Keeping in mind Yuneec Typhoon H price, this hexacopter will be the best choice from those already existing nowadays drones with a camera onboard. The following advantages make it the best one — smart modes of free flight, dodging mode, the remote control device with an embedded touchscreen and even 4К-camera, that pivots at 360 degrees. So, if you are engaged in aerial photography and filming, you definitely should pay attention to this machine. One of the best products currently developed by Dji company designers is DJI Inspire 1 Pro/RAW (the latest drone model DJI Inspire 2 has just recently entered the market and it's too early to provide any judgments about it). As for ordinary amateurs this drone will be too expensive and of little use. However, as for professional users – it'd be rather difficult to find the same high quality and attractively designed alternative to this device. DJI Inspire 1 unique feature is that its carbon supports automatically move away and rotors supports rise up right after the drone flies off. As a result of this transforming design the device camera gets full unobstructed 360° view. Inspire 1 body is made of carbon fiber that makes it aerodynamic and light-weighted and allows carrying lots of useful and sophisticated devices on board. DJI Inspire 1 Pro/RAW camera Zenmuse X5 that comes in the device set is of the highest interest. It weighs 18,55 unciae. Nevertheless, it hasn't influenced flying quality and wind resistance of DJI Inspire 1 Pro/RAW. DJI's new propeller and installation kits feature a smoother, even more reliable locking mechanism. This optimization has drastically reduced the abrasion that is common with propeller installation, therefore prolonging the propeller's overall service life. The new motor's performance has also been improved, providing a greater sense of control. The camera is supplied together with a carrier arm and it is packed in a plastic box. What is interesting about the camera is that it has an accessory lens unlike the camera that comes in a standard DJI Inspire 1 set. Zenmuse X5 — is the first in the world Digital Interchangeable Lens camera with a stabilizing arm, designed specially for aerial photography and cinematography. Its arm supports installing one of the accessory lens: DJI MFT 15mm f/1.7 ASPH, Panasonic Lumix 15mm G Leica DG Summilux f/1.7 ASPH, Olympus M.Zuiko Digital ED 12mm f/2.0 and Olympus M.Zuiko 17mm f/1.8 lens. The camera records video in 4K resolution at 30 fps in MP4 and MOV formats, as for the photos they are JPEG and DNG formats recorded on microSD. The camera has 16-megapixel matrix Micro 4/3 and it supports using accessory lenses. In addition to it the device can film at lack of light conditions due to the wide range of photo sensibility of its matrix (from 100 to 25600 ISO units). The copter can build up speed up to 50 m/h. It is now possible due to well designed construction, heavy weight and the function the landing gear raising that lessens wind resistance during the flight. To avoid collisions with obstacles the drone is equipped with two ultrasound sonars and a technical camera. DJI Inspire 1 — is a quadcopter for professionals. Its price reflects its functional capabilities. Its high-output camera capable of filming 4K video and a motorized arm that makes 360 degrees turnaround possible and ensures getting quite high quality video. On the other hand Inspire 1 price may easily push off the buyers. But on the second thought a high quality video can be recorded at 1920×1080 resolution and you can construct a copter on your own for your purposes and for the same price. DJI Phantom 3 Standard is the most affordable quadcopter with an intelligent stabilization and control system, equipped with a fantastic camera capable of recording 2.7K HD video and 12-megapixel photos. The device has everything that both an entry-level and a professional pilot may need. It has a user-friendly smartphone app that eases the device control, GPS unit for safe flights and getting back home, reliable brushless motors and lots of other stuff. DJI Phantom 3 isn't just a toy, but a full-fledged copter capable of filming and taking pictures. This machine can bring you joy and amusement: you'll see your city from a bird's eye view as well as all hard-to-reach areas and feel yourself a real pilot by performing complicated pilotage. DJI quadcopters are considered by right to be the best on the market – their earlier models have no rivals within these price brackets as for flying characteristics and software options. As for Phantom 3 Professional - this model is designed for true professionals who know for sure why they need advanced filming capabilities. The 3rd series of «Phantoms» has three versions of quadcopters – Professional, Advanced and Standard. It's almost impossible to see who is who by their appearance, that's why the manufacturer has foreseen colored stickers put on a device body. Standard version has red ones, Advanced – silvery, Professional – golden colored stickers. As for their functional differences – these are rather significant. Standard drone version differs from the others in that “remote control device-smartphone” and “remote control device-quadcopter” data exchange is performed via “wi-fi”. «LightBridge» function is missing and as a result communication distance reduces (1640-3200 feet) and the recorded video quality is getting low. No GLONASS support in its turn worsens the quadcopter positioning as well as its flying accuracy for long distances (up to 3 miles). There is no «Vision» function, that helps piloting the drone. The camera is different, too. In «Standard» and «Advanced» versions it records video at 2.7К and 30 fps. On the remote control device there are no buttons for photo and video filming, «Playback» button is missing too, as well as buttons for exposition and camera angle change. Advanced drone version is very reverse of «Standard» one. «Advanced» is equipped with the following functions: «LightBridge», GLONASS (at least 36 satellites at the same time) and the above mentioned «Vision» function. The camera was left the same. Buttons for photo and video filming, «Playback» button and scroll to change the exposition and camera angle were added to the remote control device panel. Additionally the manufacturer has foreseen 2 more buttons, action for which the user can choose himself according to his personal preferences. Professional drone version is the bestselling one and the only thing that differs it from «Advanced» version is its camera. Here the manufacturer put the camera capable of filming 4K video at 30 fps. DJI Phantom 3 general flight duration is 23 minutes. The information about the flight duration time stated in the manual coincides with the real life tests values – the new drone demonstrates approximately the same flight time duration that is indicated in its manual. Professional version copter flying range is 1,24 miles with simultaneous HD video broadcasting (in the area where there are no obstacles). Hovering ceiling is up to 1650 feet, by default it is limited with 330 feet. The device memory has records about the places where it is prohibited to fly – airports, governmental institutions and others – this list is continuously renewed. The drone take-off speed is up to 16 feet per second, it lands at 10 feet per second speed, its maximal speed is 53 feet per second! It is a very fast device, that can fly rather far. So you may see a landscape view for miles around which is very beautiful. DJI Phantom 4 is the 4th generation of DJI quadcopters. It differs from the previous models in improved FullHD camera video quality at 1080p, higher flying speed, the battery capacity and a new sensors system which consists of 2 very sensitive sensors scanning the surrounding area in the range from 0,7 to 15 meters. Due to this the device collision possibility with any obstacles is close to zero, since mostly the crashes are the reason why the device breaks down. We should also mention, that the developers have upgraded this model by adding 3-axis carrying arm with a remote control unit, due to which you get very sharp and accurate image without any trembling or vibrations even if the weather is windy or if the filming is performed at high speed. DJI Phantom 4 Pro quadcopter continues the product line and it was sufficiently upgraded in comparison with DJI Phantom 3 drone. The new device flying range is 4.35 miles, its flying velocity reaches 45 mies per hour and the flight duration is 30 minutes. If you compare this model with its predecessor DJI Phantom 3 Professional we can notice completely redesigned body with a gravity center shifted closer to rotors. Due to this the drone manoeuvre capability and control responsibility has increased greatly. Now to install rotors you don't have to screw them, it is enough just to put them on until you hear a specific click. As for the drone appearance design – there are no significant changes except for its surface now has pretty nice looking gloss coating. The company has been working to upgrade forward-collision sensing system – so the new drone “sees” obstacles at 100 feet distance in front of it, behind and under it. Earlier models could broadcast the camera data only to a tablet or smartphone, now the device set has its own 5.5 inch tablet, which is another plus of the latest drone model. Among the introduced improvements the main one is the increased flying time. Now, according to the manufacturer's information, it is equal to 30 minutes. This value was obtained due to several tricks. One of which is the battery replacement with a new one of 5870 mA/h. Thanks to the improved communications system using branded Lightbridge HD technology the machine flying range has increased as well and now it equals 4.35 miles. As for the drone structural parts, we should mention how its camera has changed. This is an absolutely new model that has much more capabilities. They include photo-balance, color correction and image stabilization. These improvements were reached due to using a larger sensor which square is 1 inch and 20 megapixel matrix. A sensor named Exmor-R also used in Sony professional cameras is responsible for the camera optics dynamic range and photosensitivity. The user still can vary video recording bit rate, at that capturing at 30 or 60 fps is performed at 100 Mb/s and 120 fps at 80 Mb/s speed. В Phantom 4 Pro now has new “smart” modes. The drone can get back home using the same route that it was flying till the connection was lost. Also the user can draw the drone route with his finger on a touchscreen. There are new possibilities of an object beacon tracking, the device can automatically fly backwards from the given point as well as taking selfies by means of gestures as it is done by Mavic Pro copter. Phantom 4 capability to provide high quality filming and photos from any camera angle has captured journalists, professional camera men and amateurs attention right away. You can enjoy the drone smooth flight for a long time and your neighbors and friends will envy you, especially when you show them videos and pictures when the machine gets back. This advanced model is ideal for young men and for filming extreme sports, trips and activity holidays. DJI Mavic Pro is the best quadcopter in 2018 that can be bought for $. Mavic not only leaves Phantom 4 behind as for the price and flying speed, it also has several flying modes, longer flying range and pocket design. Mavic Pro is second to none among all portable quadcopters. First of all we should mention the drone size. Even in comparison with Phantom series of the same manufacturer the device is rather small. The extended device size is 88х83х198 mm and in a stowed position it is even smaller. The machine weigh is quite small as well and it equals 26,21 unciae. However, what is the most interesting about Mavic Pro is that regardless its smaller size, DJI has managed to save all key functions of Phantom series. The buyer gets a complete set of front and bottom sensors that allow avoiding collisions, tracing objects, off-line landing and preserving the device stability inside without any signal from a satellite. The device set has a 4K camera like the one that is installed on the latest Phantom 4 drone. The camera has a stabilization system by means of miniature carrier arm Mavic, that stabilizes a frame along 2 axis. The camera uses the same 1/2,3" CMOS-sensor as Phantom 4, it can film 4K-video at 30 fps and videos 1080p at 96 fps. Sure, it is possible to take 12-megapixel pictures in Adobe DNG format. The camera angle has become a bit smaller: 78 degrees against 94 degrees of Phantom 4 camera angle. At that the camera has higher-aperture lens: f/2,2 against f/2,8 that Phantom 4 has. Mavic Pro has 3-axis precision gimbal camera just like other bestselling drones. The most interesting is that Mavic Pro is to some extent better than Phantom 4. For example, it can transmit video signals at 4.35 miles distance (Phantom 4 has 3 miles distance) through the new branded wireless communication interface OcuSync. The system also broadcasts video 1080p ( Phantom 4 has 720 p), which lets control the flight better and make higher-quality on-line video broadcasting throgh YouTube, Periscope and Facebook. The drone itself isn't the only innovation. The remote control device has also been improved – now it's much smaller and resembles a game pad. At that it now has an LCD screen that displays all main info such as height, speed, distance and orientation. Thus if you don't need some extended device features and on-line broadcasting to the screen it's possible to fly without a plugged in smartphone ( by the way this feature now doesn't require a cable). Mavic Pro is capable of accelerating to a speed of 40 m/h. Approximate flying time is 27 minutes in off-line mode. The batteries are replaceable, and additional battery. 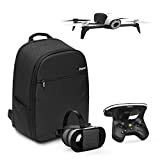 If you wish you can buy DJI Mavic Pro Bundle. This set includes the drone itself, two batteries, several rotors, a special case, a charging station. Mini-drones are smaller than a palm and they are to be used only inside, since even the lightest wing can carry the device far away. Such drones offer 2-3 flying modes: the easiest one makes the device highly control response – because it stabilizes itself and doesn't fall down this way neutralizing operator errors. If you turn of the support system the drone becomes more maneuverable and faster, that's why experienced pilots can even do some tricks with it. The largest drawback of these devices is their battery: as a rule mini-copters battery store of energy is enough only for 3-5 minutes and then the device has to spend about 30 minutes charging its battery. First you have to make up your mind as for the drone size. To learn flying an average sized (about 10 inches) quadcopter will do, because you can use it even at home as well as outside. When you are not limited with the space sizes you can fly more hours. Using such a device you can easily learn both piloting basics and more complicated manipulation and even some tricks. Although drone models in these price brackets have no hi-tech sensors, but some of them may have a camera on board. However, such a camera might be of very little use since its resolution is more likely to be very low and because of stabilization system absence the images the camera takes may be blurred. In this case Parrot AR.Drone 2.0 and its modifications are the best and optimal choice. It is strong and not expensive quadcopter of proper size and it is also highly crashproof. Holy Stone company isn’t just some Chinese No Name that has decided to manufacture drones all of a sudden to make money by selling popular devices. This brand has gained its high reputation by producing many famous and reliable drones. So, in 2017 this company introduced a new device - Holy Stone HS160 Shadow, that was said to be the one for kids and FPV beginners. 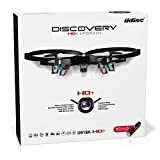 The device immediately become Amazon’s bestseller to make another drone model Holy Stone HS160 Shadow leave our top rating. 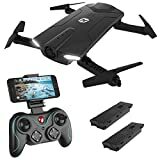 Now let’s see what makes Holy Stone HS160 Shadow drone the most wanted one for the beginners? First and foremost, it is its price. Even I must admit that the device is more than just a good one for the price. Once you finish reading the article, you’ll see that micro quadcopters cost a bit less as a rule. However, if we compare their functions - these are just toys, therefore they won’t give you any idea of what it’s like to fly a real quadcopter and how exiting it is. At that the device is also capable of recording video of quite decent quality. In case if the quadcopter crashes or gets lost (which, sadly, happens rather often), you won’t be sorry for the money spent – since it isn’t an expensive one. It has an embedded 720P HD camera. Surely, the filming quality it provides can’t be compared with any quadcopter for professionals, though this is quite enough for the beginners. The most important advantage of this device is the First Person View (FPV). Which means that you get the image from the drone camera right on your smartphone and can save videos and photos directly into its memory. The device is easily controlled, and its operating status is quickly achieved. The quadcopter has a transmitter where you fasten your smartphone, two joysticks and several buttons. Such a device is good to master skills, get the experience how to control the quadcopter. This one has 4 speeds and a very high control response. Holy Stone HS160 Shadow is controlled by means of the app (iOS or Android), while its take-off and landing are performed by means of one button. At that the device has Gravity Sensor Mode. The quadcopter is small sized, so you can take it anywhere with you and you don’t need a case or a car to transport it. The drone is a bit larger than a grown-up men’s palm and it weighs correspondingly. Bonuses you get are two powerful batteries, 3D VR headset is compatible with this drone, LED Light to fly in the evening or at night. 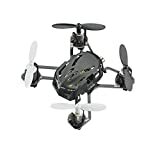 Holy Stone HS160 Shadow is the best quadcopter for the beginners. What makes me think so? This device is a combination of a low price, perfect recording and build quality as well as simplicity of operation. Although the drone has some demerits – its camera isn’t the best in the world, the quadcopter depends on weather conditions and it has small flight distance. But this is me trying to find faults, because this drone is a super device for the money. This is a new modification of a popular AR.Drone quadcopter. AR.Drone 2.0 Elite Edition has two pairs of rotors. The device can be controlled via iPhone, iPad or iPod touch connected to the gadget by means of Wi-Fi. The quadcopter has two cameras – one is in the bottom and it follows the flying process as well as transmits the route information to the computer. The second camera broadcasts video from the “pilot's cabin” to a mobile device in the real time scale. So what are AR.Drone 2.0 features? Firstly, it is its HD-camera 720p in the real time scale. Secondly, the user finally has an ability to record live video feed for free from AR.Drone 2.0 camera. Thirdly, the developers have added a new function for the drone to wing over at 180 degrees along its axis. Of course, the design was renewed too – now this toy looks like a real spaceship. It became more stylish with easier and more sufficient control. The tear-drop body has better aerodynamic properties that improve AR.Drone control outside. It is simple as usual – even a kid can get the idea in 5 minutes. The batteries of the 1st version devices are compatible with the new AR.Drone 2.0, which is very convenient. Nowadays AR.Drone 2.0 is one of the most popular drones for amateurs on the market. The 1st version of the device appeared long ago in 2010 and the 2nd version was produced in 2012 and still it is highly demanded. So where did this popularity of Parrot AR.Drone 2.0 come from? Well, it is plain and simple – the device is dynamic, comparatively not expensive and easy-to-use: it doesn't require any special skills and assembling. AR.Drone 2.0 is sold in three sets: Elite Edition and Power Edition. They differ in their starting set components. At that the price range is about 30%. 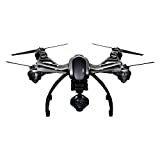 We'd recommend to choose Parrot AR.Drone 2.0 Power Edition. This version differs from the previous ones in that instead of one 1000mAh battery, it has two 1500mAh, plus three sets of color rotors. The drone camera can film video at 720p (30 fps and H264) and take pictures, however, they both turn out to be not of the best quality. The video is recorded onto embedded 4 GB SD card, but you can connect an external flash drive to the drone and perform the recording on it. As for the photos they are transmitted to a tablet or a smartphone where they are stored in JPEG format. The quadcopter control is performed via special application AR.FreeFlight, that can be installed on a tablet or a smartphone that use iOS or Android. By the way you can fly Ar.Drone 2.0 not only by means of above mentioned devices, since others are also supported, but you will have to buy them on your own. Among the quadcopter advantages except its simplicity we should also mention its sufficiently high flight level (about 50 feet), rather long flight duration and it is possible to improve the device flying range. Those who have GoPro also like installing it on the drone, though it isn't meant for this, it flies off and even flies successfully with such load on board. But there are no ideal copters and AR.Drone 2.0 has its drawbacks as well, and under some circumstances they may completely cross out all its advantages. So there are two main disadvantages: the device has rather low wind resistance and very fragile design – you should avoid any collisions since it may break down. In general Parrot AR.Drone 2.0 is a perfect option for those who want a radio-controlled toy capable of flying about several dozen meters high and simultaneous video filming. Parrot AR.Drone 2.0 – is an easy to use hi-tech toy for an ordinary user. Despite the fact that its price may seem high, this is the most affordable model of this class on the market. This quadcopter advantages are the following: quality of execution, package contents, serviceability standards, simplicity of operation, Android and iOS compatibility. It's a UFO with a camera. This is a very funny, fast and spry drone. It can easily fly in the smallest room. The device construction is very light, the rotors are protected with round covers and they are of different colors. This way you can see between the device front and back side. It is capable of all maneuvers that other larger models can do, but it performs them faster and it looks much more interesting. Rotor consoles are made of carbon and it sufficiently increases the device endurance in general. Cheap amateur radio-controlled quadcopters that cost less than 100 dollars gain more and more popularity nowadays. This is perfect chance for some new company on the market to announce about its brand and product. Exactly what UDI company has done when it produced its stylish radio-controlled quadcopter U818A. The device construction is based on 6-axis gyroscope. This quadcopter is completely ready to fly right after it was taken from the packaging and it doesn't need any additional preparations. All you need it just to put the batteries into all devices and you can start to fly. Before this an automatic synchronization of the devices is performed and it finishes with a sound signal. UDI U818A body is made of plastic, its is dismountable with an embedded proofing. At that the device control is quite smooth and responsive. The drone maximum speed outside is 5.8 m/h. Having a full battery a quadcopter can fly for about 7-9 minutes. Actually this is a very good result for a copter with a price around dollars. But still we'd recommend to buy at least 1 spare battery not to wait for an hour or more till the only battery charges. An embedded camera comes in a set, it feeds from the shared battery. It can film video and photo of low resolution 640x480. You won't get FPV using a standard remote control device, but the drone itself has such a possibility. Photo and video recording is run from the remote control and saved onto SD memory card. In general you can get about 10 minutes of video record. The remote control is a 4-channel one and it operates on a frequency of 2.4Ghz. The device is convenient, it has a screen and besides standard flying mode switches (mode 1 to Mode 2) it has a special button that makes the copter flip-over 360 degrees when it is in the air. The same can be done without using this button, but you'll have to be an experienced pilot to do that. The set that costs 60-80 USD even has 1 GB SD memory card, a kit of white and black spare rotors to get where is back and front side of the drone and what is the most important - a li-polymer battery as well as a USB power supply for it come in the set. We can say for sure that UDI U818A is one of the most affordable quadcopters with a camera nowadays: it is cheap, but at the same time not small sized, it has quite good battery and the device is well adapted for flying outside. Udi U818A quadcopter is worth each dollar spent on it. It will surely do as the first experience quadcopter or as a device for landscape filming fan providing that the drone is upgraded with a higher quality camera capable of FPV broadcasting. Syma X5c quadcopter is a very strong and modern model with an embedded HD-camera. This quadcopter is quite easy to control and it'll let you take amazing pictures and record video while flying. The drone model is applicable both in- and outside. Renewed Syma X5c-1 is developed specially for entry-level pilots. All its units and electronic devices are protected by the drone body sheathed with soft and crash-proof plastic. And once you have blade guards, you shouldn't be afraid of any crashes or collisions. If you don't have much money, but you still want to fly a quadcopter you should choose a model that is good to practice your flying skills. One of the devices that meets this requirement is an upgraded Syma X5C – 1 model. X5C-1 drone is an improved X5C version, that is also very popular and has gained a reputation among radio-controlled quadcopter fans. The main difference is that a new version has an upgraded gyroscope and due to this it is more stable. X5C Explorers stabilization system is constructed on th basis of 6-axis gyroscope. It allows not only to perform standard among all copter movements to the left and right, up and down, but also 360 degrees turnaround. Those who have flown X5C, mention its manoeuvring ability. So if you are looking for a cheap radio-controlled drone with a camera – you won't find a better option than Syma X5C. As for the flying range – it isn't large – just up to 330 feet of active remote control. The flying time is within 6 minutes (plus of minus 20%). During the flight the device camera not only makes the construction heavier, but it also consumes energy from Syma X5C battery. That's why to get maximum long flying time and astonishing photos we'd advise you to buy some more spare batteries. Syma X5C battery gets fully charged in 1- 1.5 hours. You should take this fact into consideration both before buying this drone and going to train your flying skills. Syma X5C-1 quadcopter is a strong and fast-moving drone model in its class of budget priced drones and it'll do solely to get your first flying experience. It's not reasonable to expect more from this device, since it is completely worth each dollar paid for it. Another creation of the famous Chinese brand MJX R/C Technic. A budget priced quadcopter MJX X400W has gained its popularity due to its affordable price, futuristic design and FPV flying mode of course. The device has a light weight not removable perimeter guard that makes a real difference when comparing this drone with its rivals. Rubber semispheres act as the copter underframe and make hard landing safer and easier. LED tap lights are installed along the drone axes and let the user see between the device head and tail-end during the flight. Front lights are blinking red and blue and the ones on the back are white. Both are bright enough to fly in the evening. 6-axis gyroscope is responsible for the device stabilization in the air. The copter software lets the model perform such tricks as 3D flips and 360 degrees turnaround when flying. Among the foreseen flying modes there is a self-protection function, that works when the device gets back to the user once the signal is lost. The drone control is easy to understand and user-friendly – even a kid can do it. The main task of the embedded camera is FPV flights. Quadcopter MJX X300C sends the signal from its camera via the antenna installed under the drone body. And it's not worth expecting more from it. It is possible to take pictures only when the drone hovers. Video filmed with this camera is a bit blurred which is quite expectable from such a camera. Taking pictures and filming is performed via FPV control on smartphone. It's impossible to install another camera because of the drone design. Firstly, there is no place on the drone body where you can put it (the gap under the body isn't large considering small underframe) and secondly, the copter carrying capacity is not too big. Yet the camera has HD resolution, that's why it'll do for the majority of its users. Hubsan X4 H107L is a well-proven amateurs quadcopter without a camera produced by Chinese company Hubsan. It is a global bestseller, mini-copter Hubsan X4, a version with a blade guards. It perfectly flies both inside and outside. Due to the well-designed construction, high-quality materials and light weight Hubsan X4 H107C easily survives most of crashes and collisions. Hubsan X4 H107L quadcopter was produced in summer 2013, but it is still rather highly demanded. Which is no surprise – the device is simple and rather reliable, it can fly up to 7-9 minutes and about 330 feet high. Moreover it can carry some additional loads ( you can buy a camera for 10-20 USD if you want) and perform some tricks in the air. The device control is executed via the remote control device, that operates on a frequency of 2.4Ghz and uses standard AA batteries. Its operational distance is about 330 feet (plus or minus 30 feet). This drone model is so popular, that several similar models were produced, that differ just in some details. Lets have a closer look at them. Hubsan X4 H107 is the very first version. It has no tap lights and no pads under rotors, and its remote control device has a long external antenna. These copters aren't sold now. Hubsan X4 H107L is an upgraded model, due to which it was first called Hubsan X4 H107 v2. Quite a lot of changes were introduced: tap lights, rubber dumpers to soften the device landing, antiflip mode and improved distance range as well as a remote control device (according to the official statement the range has changed from 100 to 330 feet). Hubsan X4 (H107C) 4 Channel it is the same as the previous model, but it has 0,3MP camera. 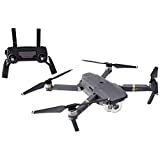 However, the camera has just increased the quadcopter weight, that's why this model has more powerful rotors (as a result the drone control has also improved) and a higher capacity battery. Hubsan X4 H107C HD 2MP with 2MP camera. Again it is similar to the previous model but with higher resolution camera. Hubsan H107D+ FPV X4 this is a model capable of FPV flying. That is, the device camera in the real time scale broadcasts video to the remote control screen and you fly seeing the first person view. Well, if you are looking for your first quadcopter, than Hubsan X4 H107D+ is a very interesting and innovative choice. Cheerson CX-10 mini quadcopter is one of the smallest drones in the world. Despite its tiny size the device has functionalities even large copter models can envy. An embedded 6-axis gyroscope eases the device control, therefore it flies smoothly and can hover in the air. This drone is designed for using it inside, but this shouldn't stop you from flying outside if the weather is windless. Advantages of this model are the following: its minimal weight and size that allow flying in very confined spaces. It is easily transported, controlled with a convenient and user-friendly remote control device, shows rather sufficient flying range. The drone has a fast charging battery as well. CX-10 doesn't have a camera on board, it fits your palm together with its remote control and weighs just 10,42 unciae. Maximum action radius of the quadcopter is 164 feet, maximum flight duration — 8 minutes. The device charges from a computer via USB cable. To charge the device 100mAh battery fully you'll need 20 minutes. This will be enough for 5-6 minutes flight. The remote control device uses two AA batteries. As for CX-10 body – it is made of high-impact plastic. There are 4 LEDs on the drone sides and its battery is fixed under the device body with 4 cap screws. Due to its light weight the quadcopter can fly the distance of 6-8 meters in a second, that's why when flying inside a room you should be careful – since plastic is still plastic and it can break. But if your drone has hit something, turn it of immediately to avoid possible breakage. I wouldn't recommend this drone to those who are just learning to fly quadcopters. But if you aren't afraid of small difficulties, this is a good choice to fly in a room or house to spend time in cold winter days. Again, I'd advise to by several sets of rotors in advance, since thankfully they aren't very expensive. This drone is of little use outside. First of all at 50 feet distance you won't even see it, plus it is completely helpless to resist wind. Secondly, if it falls in some deep grass – again you may not see it at all and loose it or step on it accidentally. When flying inside I'd recommend to stay away from the things you like and don't want to break. It is very convenient to carry this drone in a pocket, so you can use it any time you want. The battery charging time is 30 minutes. Micro size makes the device more complicated to master, than those of large or middle size ones. Its blades break very often and even the guards don't help. Estes Proto X 4606 is the smallest and the most light weight radio-controlled quadcopter in the world. If you ask any drones fan to name the smallest one, the answer will be Estes Proto-X 4606. This tiny device diameter is just 2 inches – two or three Estes Proto-X 4606 drones can easily fit an adult palm. First thing you should pay your attention to is the device size – its length and width are just 2 inches. Proto-X appearance design is typical for quadcopters of this class: it has very short beams and small blades. The device weight is 0,39 unciae. The copter body and all details are made of light plastic. Due to Proto-X 4606 tiny size it isn't afraid of any collisions and falls – it causes damage neither to itself nor its surroundings. In case of blades damage the quadcopter has spare parts in its set and you can buy some more in any shop specialized in drones sale. The drone has sidelights to fly when it is dark. There are blue LED lights on its front beams лучи and red ones on the back. They help a pilot not to loose the device and define visually where its front side is directed. Having fully-charged battery Estes Proto-X is capable of 10-15 minutes flight. When the battery is critically low, the LED lights under each rotor will turn off immediately and this way let you know about the battery level. After that the copter will stay in the air for a little while and then slowly get down on the floor. The device 100mAh li-Ion battery gets fully charged in 30 minutes, after that the copter is ready to fly again. Estes 4606 ‘Proto-X’ — is a very well designed quadcopter. It is quick and reliable, capable of staying in the air for a long time. This good-looking nano quadcopter will do for any pilot regardless of your flying experience. For the beginners the device is easy to master and for experts it'd be interesting to play with the smallest copter in the world, as well as the drone price is quite affordable to anyone. 2500 reviews on Amazon.com speak for themselves. Holy Stone HS170 Predator quadcopter is a stylish, palm-size device – and an ideal option for all who want to learn the basics of drone control. It has 6-axis gyroscope stabilization, you can fly the drone both inside and outside. Although taking into account its size – it's better to fly the copter outside in a windless day. The drawback is that its fully-charged battery provides only 5 minutes flight, that's why I'd advise buying some additional batteries, since it takes the battery about 40 minutes to charge. The device flexibility is its greatest advantage, that makes it interesting for users of both high and low flying experience. Depending on the flight mode the settings are adjusted. For example, Stability Mode will do for the beginners – in this mode the machine keeps the balance and stability itself and the most complicated functions are performed in semi-automatic mode. There are other modes for more experienced users, that allow complete control of the flight. Those who like flying trough the rooms will find Blade Nano QX RTF an ideal option. This tiny copter model has a perfect stabilization in the air. Its design feature doesn't allow using it outside when it is windy. But when the day is windless you can surely fly outside. For the beginner the fact that the device has two flying modes will be good news. These modes are very much alike and different at the same time. The first one will allow upgrading your flying skills and the second one will let you fly more aggressively and perform flips and other easy tricks. Blade Nano QX — on of the few nano quadcopters that are full of different functions. If uses the technology named SAFE: this is the one responsible for how the copter behaves in the air. According to the tests Nano QX — is a sharp moving, but well controlled mini drone. By the way you can turn this technology off and after that the drone will fly even faster, though in this case the chances that you hit something raise. The device 150mAh li-polymer battery ensures from 6 to 10 minutes of flight, depending on the conditions where you fly your copter. The battery gets fully-charged in 20-30 minutes by means of USB cable that comes in the drone set. Blade Nano QX is sold in two sets: RTF and BNF. In the RFT set everything is foreseen and all you need is just to charge the device battery, put the batteries into the remote control device and the drone is ready to fly. As for the BNF-set the remote control device is missing there. The last officially produced drone version is Blade Nano QX 3D. It means the new copter capability to flip in the air at 180-360 degrees. However, this isn't the only difference. The rotors have been replaced as well ( now they don't have a core) and the device has more powerful battery of 200mAh capacity. he device 6-axis stabilization and small size allow comfort flying inside the house. The longest flight time is up to 5 minutes which is compensated with a fast battery charge – it takes about 50 minutes. The most interesting as for this model is its special protective covering for rotors that protects not only them, but also people and surrounding objects. Even the smallest copters have rather fast rotating blades that can harm somebody or damage furniture or etc. Having bought Eachine E010 you can forget about all of these. The quadcopter is easily controlled, which makes it the best present for kids and RC-devices fans. The device package contents is not very rich, however the set has all necessary stuff to fly right after unpacking the device: the copter with a battery, a power supply, a set of spare 4 blade rotors, the device manual and remote control device (don't forget to buy two AA batteries in advance). All you need is just to charge the drone and insert the AA batteries into the remote control and you are ready to fly! Though pocket quadcopters are mainly designed to fly inside, Eachine E010 can freely fly outside as well. What is the difference between drones? A drone with camera or without it? One of the main parameters when choosing some specific quadcopter model is if it has an embedded camera on board. Relatively small number of large sized drones have it. That's why almost all drone fans install a camera on their devices themselves. In general some certain logic can be observed here – the larger the copter is the less chances it has for a camera in its set. Whereas almost all small drone models have a small embedded camera. Quadcopters without camera are the best ones to learn to fly these machines, because at first it is quite complicated to fly a drone and record video at the same time – it is a rather difficult task for the beginner. Cameras installed onto the drone body have low resolution and image quality, but these are enough for home video and etc. Quadcopters with an external camera in the set can be both amateur and professional ones. When making your choice among these models you should pay attention on their carrying capacity: if the device can lift up a DSLR camera or GoPro action camera and fly with it. There are copters that can broadcast video in the real time scale. This allows navigate the device by means of 3D-goggles. FPV abbreviation that is used for flying drones has appeared comparatively recently. This is the technology which full name is First Person View. It occurred due to using cameras installed on board of the flying drone. The idea of this function is to let the user see the image captured by the drone camera in the real time scale. The number of of this technology applications is almost infinite. It can be used for both entertainment and professional sphere. That's why drones with FPV function are used in various industry fields. They are utilized by farmers when fertilizer treatment and tracking their cattle, law enforcement authorities, rescue services and etc. Such devices are also used where it's dangerous and risky to send a man. By means of a drone with FPV feature a rescue team can examine some object before taking any measures as for emergency management or before arresting an armed criminal and so on. A drone control – via flight controller or a smartphone? Last but not least characteristic of any drone is its control method. It is convenient and acceptable among the professionals to use a flight controller to manage the drone flight. Radio-controlled copters fly stable and far since their remote control device has all necessary controls and the carrier channel is quite reliable. In this case the flight duration increases greatly and sometimes it is about several miles. However, the flying process itself becomes more complicated because the remote control functions range is wider than those of a smartphone. There are drones that use WI-FI and Bluetooth to perform their flights. And in this case an ordinary smartphone is used as a remote control. There are some advantages for the user in this way of the device control since he can control the drone flight by means of quite easy interface. The drone flying height, speed and other parameters are changed with a single finger movement on the smartphone screen. Besides, another plus here is that the user can see the filming process the copter performs in the real time scale. If necessary the user can take a picture of some interesting object he's seen while watching the video his drone was recording. Apart from some obvious advantages of flying a copter via a smartphone it has a significant drawback. You can control the device in a very limited area, namely within the Internet connection zone. That's why the majority of users prefer using remote control devices. Speed, flying range and time? A quadcopter control and flying range depend on lots of aspects: the drone and its equipment weight, the device operating units and its size. The majority of quadcopters demonstrate rather moderate parameters. Their operational time varies within 10-20 minutes. That's why when buying a quadcopter don't save on additional batteries and buy some. They will be of a great use, because the average time the battery needs to recharge is about 45-90 minutes. Keep in mind that hovering and any other functional features of the drone flying modes as well as using the camera often increases the device power consumption. Budget priced quadcopters with small flight range (up to 650 feet) and flying duration about 15 minutes will do for amateurs. If you want a drone that flies far and for a long time you'll have to pay much more – such drone models are usually chosen for some specific tasks. Racing drones are a separate quadcopter class. Flying these drones requires special skills. Having high flying speed ( starting from 55 miles per hour), racing drone models have a strong frame ( mostly made of carbon fiber), small weight (up to 900 g) and standard frame size. The camera to see racing drone course is a must in this case. The drone small size and adjustable software allow getting high control response required for precise device manipulation. Not all quadcopters have sensors. Only some of these are indispensable, that's why sensors are mostly installed on more expensive copter models, where they ensure using some special features. The most popular are GPS sensors – they let implement additional smart functions as well as allow managing the flying range and height. In some quadcopters such as DJI Phantom, GPS sensors are used for the device getting back to the fly-off point function, which is performed using one special button. Another one important technical parameter of any quadcopter is its battery. The higher capacity it has, the longer the drone flies. In average the device with an ordinary packaging contents can fly not longer than 15 minutes. If the user has a large sized drone he may equip it with an additional battery set. In this case the flight duration increases up to 30 minutes. We should mention that such an upgrade is possible for the majority of average and small sized drones. Because their weight becomes larger due to the additional battery and the device rotors power will be just not enough to lift it up. This issue can be partially solved bt means of additional batteries – you put the after the current battery gets discharged, but you have to land the copter to do this. Depending on their chemical content there are 3 types of quadcopter batteries: Li-ion, Li-Fe and Li-polymer ones. Li-Ion batteries appeared the first. They were quite light weight and had rather high capacity at that time, but it became comparatively less in time. Li-Po batteries invented later turned out to be more advanced. If compared with Li-ion batteries they have twice larger energy density on unit volume and mass. Such batteries can be very small (from 1 mm thick) and of any required shape. Another one their advantage is absence of “memory effect”. self-discharge. The battery main drawback is its mass. These batteries are the heaviest ones that's why they haven't become quite popular. Li-Po battery is considered to be the most optimal and popular one today as for the battery capacity to mass ratio. They aren't stable at subzero, but this problem is easily settled if you put a battery into your quadcopter right before flying and before that keep the battery in a warm place (in a pocket, for example). To avoid Li-Po battery early break down you should observe its storage conditions. You mustn't store a fully-charged battery! This reduces it electrochemical capacity. There are special devices for the battery storage, that keep optimal voltage of 3.85 V (they are capable of charging and discharging the battery up to the required value). It's better to store the battery in the fridge or at room temperature, though the second option is less preferable since the battery will loose its properties faster this way. Although, frankly speaking, sooner or later its capacity will still get low: approximately minus 2-4% during a year providing proper storage conditions and up to 20% off the initial capacity – in case of wrong storage conditions. In case of any drone its motors take the largest part of general energy consumption. If we look at quadcopters for example – they have 4 motors. They impell the blades of the device and it rises into the air performing the tasks you bought it for. Brushed DC electric motor for copters is characterized by a light weight and low cost. The drawback of this motor type is its low power as well as heating while rotor spinning, that leads to its occasionally replacement. Such motors don't have rather high durability and when buying a drone it'd be a good idea to get several spare motors. Brushless DC electric motor is more expensive, but at that it is more powerful and reliable. The moving element of this motor isn't a rotor, but a stator (its case). This allows the blade gaining its full speed rpm in a split second. This type of motors is more wearproof and it has higher efficiency, though thee can be installed only in large sized drone models. Modern multicopters use Brushless DC electric motors and Li-Po batteries as a power source. These place some restrictions of their flying properties: standard mass of a drone is from 2 to 9 pounds at that the flying time is from 10 to 30 minutes (some unique devices can demonstrate 30—50 minutes of flying time). Maximal carrying capacity of an average sized drone is from 1 to 6 pounds, which lets lift up a small photo or video camera (as a rule it is an action-camera for cheaper models and DSLR camera in case of professional usage drones). There are quite large multicopters with 6-8 motors (hexa- and octocopter) capable of lifting up to 50 pounds load. To enhance the copter carrying capacity manufacturers use aligning arrangement of loading rotors, which in case of hexacopter, for example, gives 12 motors and 12 rotors put in pairs on 6 support beams. Multicopter flight speed can vary from zero (the device hovers) to 62 m/h. The batteries energy level allows some copter models flying up to 4-8 miles long. In the real life their operating range (maximum distance that the device can fly and then get back to the fly-off point) is limited with direct visibility (350-650 feet in case of manual control) or with the radio-control devices range coverage. Thus this is the device flight time that applies the strongest limitation on drones operating range. These restrictions lead to the fact that drones are usually used as a “short range” devices: to perform amateurs flights not far from the user, to take pictures and record video of closely located objects and etc. Nowadays quadcopters with different number of blades (from 4 to 8) are produced. The more blades the device has, the faster it can get to the point of destination. The flight stability depends on this number as well. But on the other hand the more blades the copter has, the more expensive it is. Besides such device battery discharges much faster. That’s why a quadcopter for the beginners as a rule has minimum number of blades. As for the device size, drones are divided into 3 classes according to this parameter: large, average and small sized (nano quadcopters are considered as a type of small sized ones). The drone price, carrying capacity and operability enhance proportionally to its size. Large drones vary from the others in high carrying capacity and they are designed for long flights without the battery trickle charging. Their maximum flying height also impresses! Such devices are bought for professional needs. Quite often these models are equipped with additional batteries to increase their flight range. Average sized drones have become a mass product. They easily fit a common rucksack, they are quite fast and strong. Many models are equipped with an embedded camera with quite acceptable video quality. Such devices can fly rather high. Sometimes a recording device is bought separately and installed on the drone later. Copter of this size can be used inside as well but its flight will be obviously restricted with the room center, although outside they fly far and high. Small and nano sized copter models are more often bought by the beginners that are just learning to fly these devices. Such models have simple construction and they are easily controlled. You can use them in a room or in a small office. It isn't very likely that you lift up anything with a nano quadcopter or take a quality photo, but you'll surely enjoy flying this tiny device. Lately completely tiny drone models have appeared – they can fit a palm (Walkera Ladybird, WLtoys V929 and etc). They are almost safe (the device mass is about 1,41 ounces), at the same time the user can yet get the piloting skills since control principles are still the same. Quadcopters of this size can be used at home without a risk of doing any harm to people or objects. 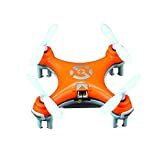 Buying exactly this drone type is recommended to the beginners to get their first flying experiences. This is the most important question when you are making your mind as for which quadcopter to buy. This is the budget that can sufficiently limit your choice and this is what also restricts the copter capabilities within a certain price. If the copter is to be used as a toy then 100-150 USD will be quite enough. If a copter is needed to record video, the budged will raise several times. The drone with more functions, capable of broadcasting video on-line, flying longer time and controlled via iPhone, iPad or similar gadgets and filming Full HD video – such a device will cost several hundreds dollars. A really professional copter with a flying range up to 2 miles and flying time about 30 minutes and more, with 4K camera in the set and a stabilization carrying arm – this drone will cost about 1000-2000 USD. How not to break or loose your drone? Unlike a plane that can fly with a turned off engine or a helicopter that can land by means of Autorotation, a multicopter when its motors or power turn off gets completely unpiloted. The quadcopter can save stabilization if one of its motors turns off. Hexacopter and octocopter apart from this can perform soft landing with one motor off, however not in all cases (for example, if even one of the blades gets broken due to the disbalance caused the flight controller stops working and the drone starts out-of-control descent. Considering the fact that a multicopter has quite sufficient mass and strong body with fast spinning rotors its collision with people or transport may have some negative consequences. That's why flights where people or transport are around are highly not recommended. It's desirable to plan the flight route that in case of necessity ( for example if the battery is low) there will be some free space for safe landing. The human factor is also important. Modern flight controller in its adjustment complexity and the number of flying modes is almost like a PC. Not attentive reading of the manual or some necessary actions not performed ( for example, a compass calibration when adjusting the device) may lead to incontrollable flight and loosing your drone as a result. If the drone gets out of the remote control device action radius and GPS coming back mode is absent – this is another reason why drones get lost. Among the vast number of drone companies there are those, whose models stand out from the rest for their features and they are considered to be one of the best for various parameters. DJI is a company that produces bestselling quadcopter models for professionals. Its products have never been low-end ones, however they have always been high quality ones with a sufficient number of hi-tech stuff and perfect performance characteristics. Syma is a Chinese manufacturer of not expensive drones popular due to its simplicity, reliability and not very high price. These were Syma quadcopter models that became the first drone models for the majority of users. Parrot is a French drone company. It produces moderately priced devices for entertainment. Its drones have rather good cameras and control response. Walkera is a company famous for its high quality and technically ingenious copter models. It produces high speed devices, though there are also some good FPV models with camera in its product line.